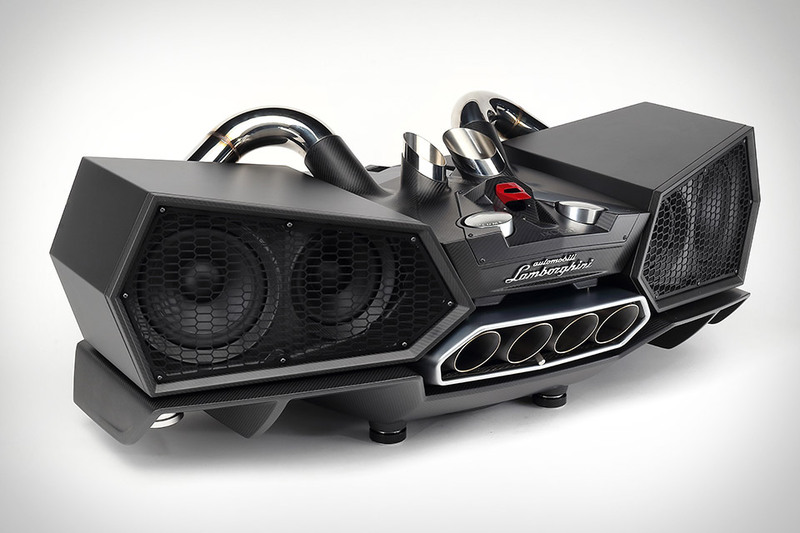 You might not be able to drive a Lambo everyday, but you can appreciate their design on a regular basis with the Ixoost Esavox Lamborghini Speaker System. Crafted from a carbon monocoque chassis, two hand-made wooden side cabinets, and an original Lamborghini exhaust, it outputs sound as loud and detailed as one of the Italian sports cars. It has 800 wats of total power spread across two 1-inch tweeters, two 6.5-inch full-range drivers, two 8" woofers, and a massive 15-inch downward-facing sub. Powered on with a start button like the ones used in the cars, it accepts audio over Bluetooth or RCA inputs and is available in four exclusive colors. Like the Model One before it, the Wrensilva Standard One Stereo Console packs modern hi-fi components inside a classic design. Within its handcrafted wooden frame, you'll find a custom integrated 300 WPC Amp hooked to a pair of custom 8 inch 2-way speakers on end and a fully decoupled belt driven turntable with phono preamp on the other. Bluetooth is built in, extra inputs are available inside the cabinet for adding other audio sources, and the built-in vinyl storage pockets let you keep your favorites handy, while the magnetic grilles let you decide whether to expose the speakers or kid them hid. Sporting a simple design that pairs two cubes with a acoustically-designed aluminum baseplate, the Aerix Duet Music System provides outstanding audio in a handsome package. Thanks to 360-degree horns, a down-firing 5.25" subwoofer, and a 200 watt amp, it gives you great sound no matter where it's placed, and support for WiFi streaming from sources like Spotify and Pandora means you can put it anywhere you want. It also has AptX Bluetooth for playing music from your phone or tablet, and a slot-loading CD player gives you a reason to dust off you physical media collection. Okay, so technically speaking the whole turntable doesn't levitate. Just the platter of the Mag-Lev Audio Levitating Turntable floats in the air, holding your favorite albums in a friction-free spin above the main unit. It uses patented technology to maintain precise magnetic tuning of the platter's spin, which can be set to 33 or 45 rpm with the turn of a button. A Pro-Ject 8.6 tonearm and Ortofon OM 5E cartridge make sure your music sounds great, and a semi-automatic system returns the tonearm when the record is finished, meaning you can walk over and flip it or grab another at your leisure. Our mobile devices keep getting more powerful. Their microphones don't. The Blue Raspberry Microphone fills this gap with excellent audio quality in a highly portable package. It does so with proven microphone technology and a new, patent-pending Internal Acoustic Diffuser that mimics the acoustic treatments found in studios and concert halls to focus on your voice or instrument and ignore unwanted noise. The folding, integrated stand also helps in this regard, minimizing surface contact and isolating the mic from vibrations and other noise. It connects over USB or Lightning, works with a host of both mobile and desktop recording apps, and comes with a soft carrying pouch. Porcelain is a naturally low resonance material, making it ideal for these Raumfeld x Rosenthal Porcelain Speakers. A collab between the high-end audio and porcelain manufacturers, the speakers' teardrop shape optimizes the acoustics from the coaxial speakers, driven by a 160 watt Class D amp. Laying claim to the title of "first steaming speakers made from porcelain", it also has integrated Wi-Fi for app-controlled playback, as well as line-in, Ethernet, and USB inputs. The price is jaw-dropping. So is the sound. The idea of a standalone music player might seem prehistoric, but the Sony NW-WM1Z Walkman Music Player makes a strong case for its continued existence. It has a gold-plated, oxygen-free copper chassis that reduces contact resistance and magnetic interference, and an intuitive touchscreen interface. But the real magic happens on the inside, thanks to a dual clock circuit, 384kHz/32bit recording, Quad DSD playback when used with a balanced connection, DSEE-HX signal processing, and a robust FT CAP power supply to improve low-end performance. Just remember: to sound its best, it's going to need a better source than your library of torrented MP3s.